When you're done here, don't forget to check out the rest of the USFL's best. Gary Anderson, RB; Bandits- one of the league's top runners, he supplied Banditball's running threat...his versatility kept Bandits' opponents off balance...joined Tampa Bay midway through its inaugural campaign, running for 516 yards in 8 games...caught 29 passes for 347 yards...ran for 1,008 yards in 1984 with 19 TDs and had 66 catches for 682 yards...was even better in 1985...ran for 1,207 yards and 16 TDs and caught 72 passes for 678 yards...went on to play for NFL's San Diego Chargers, Tampa Bay Buccaneers and Detroit Lions...best NFL season was in 1988 when he ran for 1,119 yards with a 5.0 yard per carry average for the Chargers...his season-long holdout in 1989 hurt the Chargers' offense and hastened the end of his career. Gary Barbaro, DB; Generals- arrived in New Jersey in 1984 after seven seasons with the NFL's Kansas City Chiefs...played only one season for the Generals, intercepting four passes with 56 return yards...earned All-USFL honors from The Sporting News...ended his playing career with a torn anterior cruciate ligament...attempted a comeback later in the year, but only lasted four plays before reinjuring the ACL...prior to his days in the USFL, Barbaro picked off 39 passes as a Chief, including one returned for a then NFL record 102 yards...won Mack Lee Hill Award as Chiefs best rookie in 1976...Chiefs MVP in 1977...three time Pro Bowler (1980-82). Fred Besana, QB; Invaders- a surprisingly solid player in his first two seasons...led Invaders to a playoff berth in 1983...completed 345-550 passes for 3980 yards, 21 TDs, 16 INTs...started slowly in 1984 along with the rest of the Invaders offense...went 257-446 for 2,792 yards, 14 TDs, 12 INTs...played in every game for Oakland the first two years...relegated to the bench with Bobby Hebert's arrival in 1985...went 34-58 for 494 yards, 6 scores, 4 INTs in limited action...never received a shot at an NFL position. 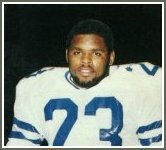 Curtis Bledsoe, RB; Wranglers, Federals, Renegades- consistent back who played on some weak teams...spent two seasons with Kansas City Chiefs before joining USFL...split his 12 1983 games between Arizona and Washington, running for 321 yards and catching 16 passes for 100 yards...broke out in 1984 with 246 attempts for 1,080 yards and 7 TDs for the Feds...with Orlando in 1985, he carried the ball 207 times for 781 yards and 3 scores and caught 38 passes for 247 yards. Luther Bradley, S/CB; Blitz, Wranglers, Gamblers-began career in 1978 with Detroit Lions...played four years in the Motor City... led USFL with 12 interceptions in 1983 for 167 yards and a TD...had incredible 6 interception game (a pro football record) and a score against the Bandits...picked off 4 passes for 38 yards with Wranglers in 1984...not protected in Arizona/Oklahoma merger following 1984 season...rebounded to make 12 INTs for Gamblers in 1985 for 161 yards...returned one pickoff for a 36 yard TD. 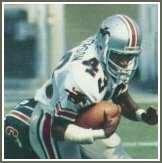 Kelvin Bryant, RB; Stars- one of the best runners in the league, he paced the Stars offense...in 17 games in 1983, he ran for 1,442 yards and 16 TDs, caught 53 passes for 410 yards...in 1984, ran for 1,406 yards with 13 TDs, caught 48 balls for 453 yards in helping Stars capture first title...ran for 115 yards and a TD in the 1984 championship game...rushed for 1,207 yards and 12 scores in 1985...gained 103 yards and scored 3 TDs in 1985 title game...last player to touch the ball in a USFL game...played with Washington Redskins from 1986-1990...hampered by a knee injury that kept him sidelined throughout the 1989 season. Anthony Carter, WR; Panthers, Invaders- joined the Panthers late in training camp, but quickly gelled with QB Bobby Hebert...A.C. caught 60 passes for 1,181 yards and 9 TDs...caught 9 balls for 179 yards and the clinching score in the 1983 title game...had 30 catches for 538 yards before a broken arm suffered against San Antonio in week six ended his season...made 70 catches for 1,323 yards and 14 TDs with the receiver rich Invaders in 1985...starred with the Minnesota Vikings for several seasons before returning to Michigan to play for the Detroit Lions...caught 10 passes for more 227 yards in 1988 playoff victory over the 49ers. Maurice Carthon, RB; Generals- one of the best blocking backs in pro football, he frequently paved the way for Herschel Walker...1983 running: 334 yards and 3 scores plus 3 two-point conversions...had best year in 1984 with 1,042 yards and 11 TDs...was a major contributor to Walker's record in 1985...ran for 726 yards and 6 TDs, including a 55-yarder...became Joe Morris's and Ottis Anderson's blocking back with the New York Giants and finished career in 1992 with the Indianapolis Colts. Pete Catan, DE; Gamblers- a former Winnipeg Blue Bomber, Catan joined on with the Gamblers in 1984...topped the team with 16 sacks, the second highest total on the league, for 146.5 yards in losses (unofficial numbers)...added 11 more sacks in 1985 for 75.5 yards in losses despite missing several games...landed on the league all-pro team in 1984 and made the second team in 1985. Gary Clark, WR; Bulls- a tough receiver out of James Madison, he caught 56 balls for 760 yards and 2 TDs in his rookie year of 1984...caught just 10 passes for 61 yards in 1985...blossomed in the NFL with the Redskins...developed reputation as one of the toughest receivers in the league...caught 7 passes for 114 yards and a 30-yard touchdown in Super Bowl XXVI. Reggie Collier, QB; Stallions, Federals, Renegades- third player selected in 1983 draft...played in 7 games, going 47-108 passing for 604 yards, 1 TD and 7 INTs...traded to Federals after Birmingham signed Cliff Stoudt...saw action in 9 games, completing 82-160 passes for 969 yards, 6 scores, 12 INTs...continued improvement with Renegades in 1985...229-427 for 2,578 yards, 13 TDs, 16 INTs and ran 92 times for 606 yards, 12 TDs including a 71 yarder...ran for 171 yards in game, the pro record for a QB...played with Dallas Cowboys in 1987 and Pittsburgh Steelers in 1988...also played in the Arena Football League. John Corker, LB; Panthers, Showboats- jumped from the Houston Oilers where he played from 1980-1982...led USFL in 1983 with an astounding 28 sacks for 199 yards in losses...also recovered 2 fumbles for 100 yards and a TD...dipped to 8 sacks for 52.5 yards in 1984...not protected in the merger of the Panthers and the Invaders...finished with 5.5 sacks for 43.5 yard in losses for 1985 Showboats...finished outdoor career in 1988 with the Green Bay Packers...played for Detroit Drive in the Arena Football League. Joe Cribbs, RB; Stallions- left a starring role with the Buffalo Bills to sign a future contract with the Stallions prior to 1983 NFL campaign...ran for 4,046 yards with the Bills in four seasons, including three 1,000 yard seasons...Pro Bowler in 1980, 1981 and 1983...Also a dangerous receiver out of the backfield, he became the main cog in Birmingham's offensive attack...burst on the USFL scene in 1984 with 297 rushing attempts for USFL best 1,467 yards and 8 TDs...also caught 39 passes for 500 yards, 5 scores...ran for 112 yards and a score in playoff win over Bandits...1985 stats: 267 attempts for 1,047 yards, 7 TDs...caught 41 balls for 287 yards...following USFL days, played for Bills, San Francisco 49ers, Indianapolis Colts and Miami Dolphins. Marcus Dupree, RB; Breakers- a great runner with loads of talent, injuries cut short the career of this troubled college star...signed with the Breakers after week one of the 1984 season and eventually played in 15 games...ran 145 times for 684 yards and 9 TDs...a major knee injury limited him to just 17 carries for 69 yards and a TD in 1985...after more knee surgery, played for Los Angeles Rams in 1990 and 1991. 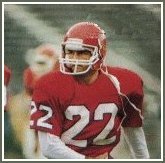 Irv Eatman, T; Stars- his blocking helped open the holes for Kelvin Bryant...eighth player drafted in 1983...made all league team from 1983-85...named USFL's Man of the Year in 1984...went on to stellar NFL career with Kansas City Chiefs, New York Jets and Los Angeles Rams. 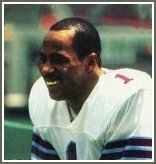 Vince Evans, QB; Blitz, Gold- joined Blitz after career with NFL's Bears...1984 stats: 200-411 passing for 2,624 yards, 14 TDs, 22 INTs for Marv Levy's Blitz...joined the Gold's run and shoot in 1985, completing 157-325 for 2,259 yards, 12 TDs, 16 INTs and ran 43 times for 283 yards and 7 TDs...with most observers thinking his career was over, played several more seasons with the Los Angeles Raiders. Doug Flutie, QB; Generals- Heisman Trophy winner in 1984 for Boston College...highligh of college career was game-winning hail mary against Miami...was given choice of which USFL team he wanted to play for...Generals' owner Donald Trump traded Brian Sipe in the preseason so Flutie would have to start...1985 passing: 134-281 for 2,109 yards, 13 TDs, 14 INTs; ran 65 times for 465 yards and six TDs...a broken collarbone shortened his only USFL campaign...after brief stints in the NFL with the Chicago Bears and New England Patriots, left for the CFL...considered too short to play NFL quarterback at just over 5 foot 9, he jumped to the Canadian Football League...multiple-time CFL MVP with British Columbia, Calgary and Toronto. Todd Fowler, RB; Gamblers- a dangerous runner in the run-and-shoot...ran for 1,003 yards on 170 carries for a 5.9 yard average in rookie year of 1984...also ran for 11 touchdowns...signed by the Dallas Cowboys to a future contract to take effect after Houston's 1985 season...dipped to 92 rushes for 402 yards and 3 scores in 1985...played from 1985-1988 with the Cowboys. Chuck Fusina, QB; Stars- after 3 years as a backup with the Tampa Bay Buccaneers, went to Stars where all he did was win...completed 238-421 passes for 2,718 yards, 15 TDs, 10 INTs in 1983...topped league QBs in passer rating in 1984, completing 302-465 for 3,837 yards, 31 TDs, 9 INTs...led Stars to championships in 1984 and 1985...1985 stats: 303-496 passing for 3,496 yards, 20 TDs, 14 INTs...named Outstanding QB by league and named to Sporting News' all league team in 1984...one of the circuit's most consistent passers and deadliest when the game on the line...also played for Green Bay Packers in 1986.